● It can provide all the light that plant needs to grow and flower, can help plant grows quicker and better, increase yield. ● It's simple. High yields, low heat and low power consumption. ● Supplement sunlight, especially in winter with shorter daylight. Increase the longer time for plant in order to trigger specific growth and flowering and help plants grow quicker, decrease growth circle. ● Warm to touch, won't burn plant . No high wattage cooling systems needed, 50%-70% saving in energy cost. ● Promote plant growth Increase fruitage Extend flowering time Make the plant more colorful. ★Do not use the lights in dripping water or anywhere where they will get wet, water and electricity can be a dangerous mixture. ★ Don't touch or move when the light working. 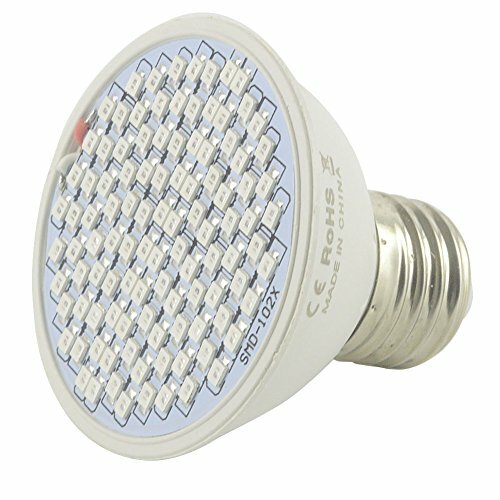 ❶ 106pcs High-efficiency LED chips:86 LEDs Red + 20 LEDs Blue, Plant growth lights, Simulated sunshine,Wide Application:Ideal for all phases of plant growth. can be used in house garden, pot culture, breeding, flower exhibition, bonsai, sowing, farm, greenhouse cultivation and so on. ❷ Most of the sunlight spectrum are useless for plants growing. Just Blue, Red light has the biggest contribution for plants, and useful for increasing the harvest. ❸ Better growth program Our growing light spectrum which tested and developed with many grower, provided the most necessary light that plants need for optimum growth. This is a great solution for indoor growing. ❹ Easy to use: Well constructed and suited for a standard E27 socket in indoor settings, the plant grow lights is easy to set up and use. No special lamp base needed and a desk lamp will do. ❺ Plant light can provides the most efficient wavelengths of light to enhance photosynthesis performance hence improving plants' healthy growing.Add extra sunlight to the plants, stipulate the photosynthesis; help shorten the growth cycle. If you have any questions about this product by BeiLan, contact us by completing and submitting the form below. If you are looking for a specif part number, please include it with your message.